Good vision is vital during our school years. If a child cannot see the board properly, or the words are blurred when they try to read, they will find it difficult to perform to their full potential. That’s why Specsavers has teamed up with Thomson Screening to deliver free vision-screening software to every primary and secondary school across the country. We want every child to have the opportunity to learn, unhindered by problems with their eyesight. 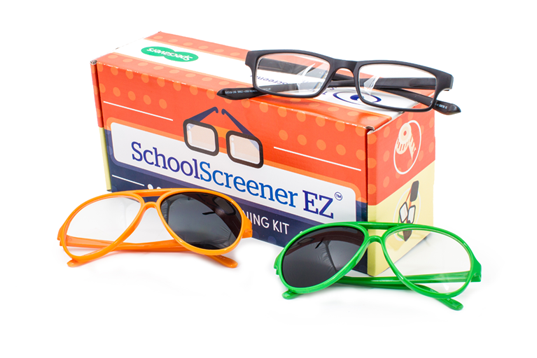 SchoolScreener EZ® is an easy-to-use technology, developed by scientists at City University, London. It is designed to be operated by teachers, teaching assistants and even volunteers, enabling them to carry out a three-minute preliminary test of each child’s eyes. The screening includes a test for colour vision and can be used on children of all ages. Once each screening has been performed, the software quickly calculates the results and immediately identifies any potential problems with the child’s eyesight. It then automatically generates a report, which will be sent home to the child’s parents or carers to let them know what the next best step would be. It might be that the recommended course of action is for the child to undergo a thorough eye examination with an optometrist. The Screening for Schools campaign follows recent research by the College of Optometrists, which found that less than a third of local authorities in England are providing vision screening for children, despite national recommendations that all four-year-olds should be checked. Specsavers’ own research in 2014 revealed that one in five children under the age of 12 had never had an eye examination, yet there is good evidence that 15-20% of children have poor vision in one or both eyes. Detecting and managing vision problems while children are still young is key to maximising their education and minimising the chances of an eye or sight defect being carried into adulthood. To learn more about the Screening for Schools campaign, click here. If your child’s school is not already signed up to this scheme and you would like it to be, discuss it with their class teacher.